In order to explore a way to tailor thermal hysteresis behavior of spin-crossover (SCO) complexes, a series of seven FeII(LX2) complexes with different ligand configurations has been designed or reconstructed. 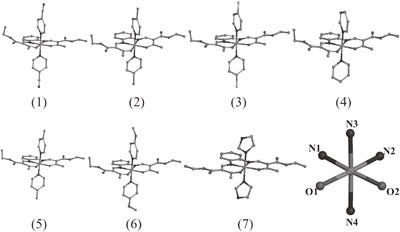 These FeII(LX2) complexes differ in axial ligands X = Py, CNPY, NC5H4CH3, NC5H4OCH3, NC5H4Cl, X = NC5H4Br, and Him. Geometric structure, electronic structure, and magnetic properties of FeII(LX2) complexes have been investigated using density-functional theory with full geometry optimization. Our calculated results show that the spin-state electrostatic-energy difference (ΔU) of these FeII SCO complexes can be tailored by adjusting the pKa constant of axial ligands X. The increase of ΔU of these FeII SCO complexes from −12.18 eV to 6.64 eV results from the increase of pKa constant of axial ligands X from 1.10 to 7.00. The role of axial ligands X in determining SCO behavior of FeII SCO complexes has been revealed. In addition, our previous study (N. A. Tuan: J. Appl. Phys. 111 (2012) 07D101) demonstrated that thermal hysteresis of spin-crossover increased with the ΔU of FeII SCO complexes. These results would give some hints into how thermal hysteresis can be tailored in FeII SCO complexes.